If ISIS didn’t produce this map, who did? I can’t tell, but certain features of the map suggest a partial answer. Notice how different text labels on the map are in different sizes. There’s no particular reason why HIJAZ, for example, should be printed four times larger than IRAQ. Notice, too, how four text labels (Andalus, Anathol, Yaman, The Land of Alkinana) are attached to their regions by rays with a dot at one end. Is there any reason why “Andalus” has to be stuck far out in the Atlantic? Or why “The Land of Alkinana” has to be printed over the Indian Ocean rather than fitted into its region of the map? I’ve noticed these weird map practices before, and I don’t think they’re accidental. I believe they are meant to give the map a more chaotic, complicated, hence intimidating appearance. Steven Emerson (a once-reputable journalist and researcher who has swapped his objectivity for lucrative fear-mongering against Muslims) has displayed similar maps when making his case that America is crawling with potential suicide bombers. I have an example that was shown to a Senate subcommittee back in 1998. 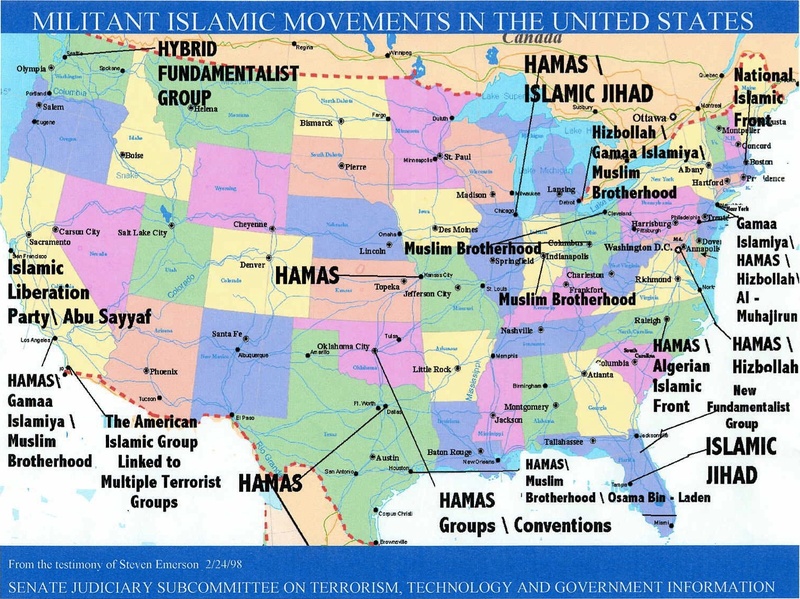 Style before substance: This map accompanied Steven Emerson’s “scary Muslims” testimony before a Senate subcommittee (Feb 1998). Notice the varying font sizes. The way the three alleged “Muslim Brotherhood” outposts in Cleveland, Columbus, and Indianapolis are labeled haphazardly. The two “Muslim Brotherhood” text labels seem to compete for prominence. A giant “HAMAS” label hovers over Colorado, sending a ray shooting east to Kansas City. I have no reason to conclude that Emerson or his people made this so-called ISIS map. But there are definite signs of influence — not excepting the glaring ignorance of the region and its history. Don’t assume that criticizing the alleged “ISIS map” means I support ISIS (or whatever it’s called). The “Islamic State” is neither Islamic nor a state; it is a vicious criminal organization that I believe is doomed, first, to failure, and second, to being remembered with hatred and contempt, even by many of those in Iraq and Syria who initially supported it. ISIS, or DAESH to use the Arabic acronym, has won victories and taken territory only because of the level of chaos in Syria and much of Iraq. There are two main causes: One is the Syrian president’s implacable war on his own people, causing the worst humanitarian crisis since World War II. The other cause is the U.S. invasion and occupation of Iraq, a cornucopia of crisis since 2003. History will remember “ISIS” as only a footnote to these two historic tragedies. I wonder how long it will take for Americans to learn that very few problems have military solutions. It seems that we always reach first for the sledgehammer. Posted in history. Tagged Africa, Arabic, Asia, Eurasia, geography, Iraq, ISIL, ISIS, Islamophobia, jihadists, map, Mediterranean, Mideast, Muslims, Syria, terrorism. Previous: Previous post: How many Muslims are joining ISIS? It seems this map has resurfaced recently and people are making a big deal about it once more. This was an interesting read, I look forward to reading more of your work! Thanks, Adi. Someone has linked the map to the new book Empire of Fear: Inside the Islamic State , by BBC correspondent Andrew Hosken. I doubt that the map actually appears in the book, but some cheesy web articles say that it does. They also misspell the author’s name (“Hoskens”). The book is here if you’re interested. This is interesting alarob… Sickchirpse com isis masterplan.!! Orobpa is a word that means ‘Affection, \Love’, tender feeling (for the homeland, for the family, for a person that a person wishes to marry, etc.). It has survived to our days in our post-Soviet Republic called Sakartuelo//Sa-KARTU-elo meaning the Land called Kartu. We have national//ethnic songs entitled”Orobpa//Oroppa ( about Love, Affection). They are sung by various singers of our ethnicity at concerts, in the family and on the Internet web-sites. Orobpa//Oroppa is the CORRECT name of a lady that became the queen of the island called Kurato (modern Creta//Crete). Oropa//Avruppa//Europa’s husband’s mother was the sister of Medeia that ruled the kingdom called after her name “Media” at the Caspian lake(“Sea”) and the Caspian Naphtha//Oil was called Medeia/s Naphtha//Oil//Naphtha of Medeia’s country” by the Byzantine Wmperor Justin. !.. Asia means ‘Love’ in the Cuneiform Sumerian and Akkadian ancient texts, hence Aia and Oroppa//Europa//Avruppa are synonyms and mean ‘Kindness, Afection, Love”. That’s very interesting, but probably completely unrelated to the map, as the “Orobpa” you discuss is from the Georgian language. Georgia (Sakartvelo) is one of the world’s oldest Christian nations. 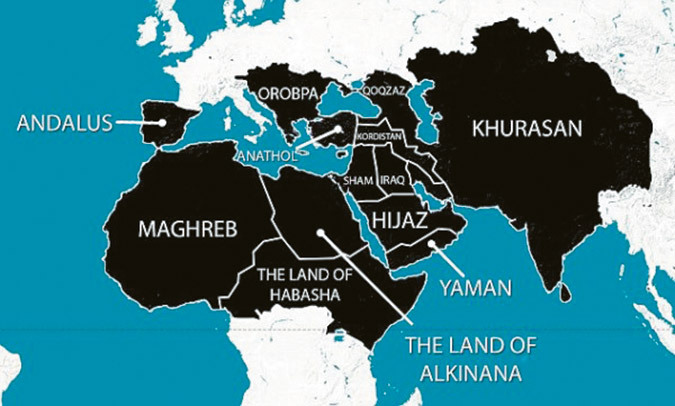 So it is not a good candidate for sourcing names on a make-believe ISIS map. Of course, the info you provide may help explain why the map has such a bizarre misspelling of the Arabic “Euruba” as “Orobpa.” Perhaps the map’s designer was from Georgia. There’s no way to know, of course, without more evidence concerning the map’s origin. I’m sorry friend but all ISIS leaders were born, and raised, Muslim… ISIS follows the Koran and Mohammed. They ARE a Muslim organization… From what you point out it sounds as if a Muslim literate in Cyrillic and only somewhat in English wrote this map. It has nothing to do with Muslim areas but simply areas that ISIS wishes to control. I feel that your motive is simply to protect Islamic radicals and to assist them in migrating to Christian countries. You may insist that those thugs are not “ISIS leaders.” In that case, explain your criteria for “leaders” and demonstrate that no one who fits that definition is a convert to (or former apostate from) Islam. Extraordinary claims require extraordinary evidence. Considering that many leading ISIS honchos used to identify with Saddam Hussein’s secular and socialist regime, I think you’ll find they are only nominal Muslims. Only if you believe their propaganda. Public opinion among Muslims around the world is overwhelmingly against that claim. For example, the majority refuse to use the name “Islamic State.” Instead, Arabic-speaking Muslims use the insulting nickname “Daesh,” while English speakers lean toward “ISIS” — both names that ISIS itself objects to. If you want more formal evidence, there is the open letter to Baghdadi signed by 122 Muslim scholars from around the world, which condemns ISIS dogma and is intended to discourage young Muslims from enlisting with ISIS. Islam is a decentralized religion without a pope or central council. So a statement with this many signatories from different backgrounds is quite rare. You can read the letter itself here (http://www.lettertobaghdadi.com/) or if you’d rather not wade through the Islamic lingo, the Wikipedia article sums it up with bullet points here (https://en.wikipedia.org/wiki/Letter_to_Baghdadi). It is exactly the kind of condemnation that we in the West keep demanding. But when it is delivered, we manage to ignore it or dismiss it as meaningless. Of course ISIS has condemned every Muslim who endorses the Letter to Baghdadi as a kaffir or infidel. This just emphasizes the gulf between Islam and ISIS. Close to 99 of any 100 Muslims would tell you that ISIS has no right to judge other Muslims. A large majority would say that no one has the right to make that kind of judgement. I don’t suppose any of this will satisfy you. People who wish to believe that Islam is their enemy will continue to believe it. try write a terrorist attack plan and send it via imessage sms or email, it will be red flagged.